This document contains the case study relating to intelligent robotic process automation (iRPA) implemented at Hollard, a leading insurance firm in South Africa. The implementation was completed during 2017 and the case study refers to the success of LarcAI as a key provider in the field of intelligent robotics and the capability of the vendor to understand and solve complex customer centric solution objectives. LarcAI is an intelligent technology provider with extensive consulting and development capability to support the implementation of configurable intelligent robotic solutions. By using standard products available in the market, LarcAI adds value by transforming these products into intelligent virtual employees to interact with humans and complete suited tasks and activities to support human processing requirements. Hollard identified an opportunity to streamline their operations by adding virtual assistants (known as robots) into their end-to-end processes. In this particular case study, high volumes of email are received from the broker base and other relevant parties which needs to be processed against specific conditions and parameters contained in the agreements and should at all times be compliant with the regulatory and statutory provisions. The broker-driven service delivery model used by Hollard requires specific compliance to SLA conditions. The successful implementation of the virtual assistants, depended on high levels of accuracy and meeting timeframe expectations. It was also considered important to maintain a harmonious transition into the new supported capability. This required that the broker community should not experience any negative impact and should remain largely unaffected in view of their operations, except for experiencing the benefits as explained. Realising the full benefits was dependent on Hollard using the robot effectively to solve the need for replication of the information content between the broker channels and own internal processes to avoid manual recapture of shared information. Further benefit was attained by using the automated interaction to enforce governance and control when accepting instructions to limit non-compliance to required procedures and standards enforced by regulations. Processing volumes estimated in 2016 when the initiative was conceptualised, was in the region of 1.5million email transactions per annum and has grown at a rate of 30% year on year. Reprocessing of information was in the region of 70-80% based on the information content already maintained elsewhere in the network and alternative systems within the technology landscape. Due to the volumes to be processed, there were often backlog scenarios to be dealt with. The primary driver of the initiative was not to replace staff, but to use the existing staff more effectively and create the support structures through technology to enable higher efficiency and prevent backlog with escalating volumes. The design of the iRPA initiative had to consider this requirement and therefore only certain components relevant to the objectives were automated through the introduction of virtual, interactive assistance executed by the robot instances. Core values of the Hollard operations required the solution to remain customer centric in all aspects and to provide improvements without affecting the morale and sentiment of the staff. The challenge was to displace approximately 2000 full time equivalent man-hours per month to meet the operational savings objectives. Hollard identified an opportunity to streamline processing within their operations by adding interactive robotic technology into their end-to-end processes, the context thereof is provided in the following diagram. The logical design parameters required the robot to be robust and configurable to ensure minimal technical intervention when servicing the robot and aligning the finished implementation operations to the final requirements. It was a design consideration to limit technology footprint within the organisation to ensure that there would not be a significant displacement of operational costs to the technology area which would substantially increase the cost of technology operations and thus limit the benefit to be obtained from the initiative. Microsoft Cognitive Toolkit is an easy-to-use, open-source, commercial-grade toolkit that trains deep learning algorithms to learn like the human brain. Watson analytics services available on the Bluemix cloud platform from IBM enables your robot to learn, reason and consider context when processing data or requests. Accord.NET Framework is machine learning framework written in C# and enables building production-grade computer automation enablers for commercial use. ABBYY software provides optical character recognition, document capture and language software – products intend to simplify conversion of paper documents to digital data. The decision was taken to enrich the UiPath base software and integrate interaction with the Accord framework to initially provide for the technical rendering of the requirements. This left the option open to further extend the current implementation with more functionality and other add-ons at a later stage as requirements evolve. 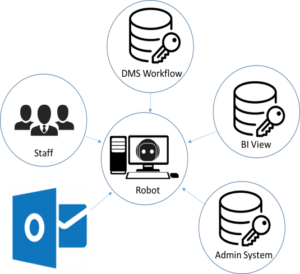 When engaged, the robot interprets the emails received and reduces the content to data available for processing. Logic is required to interpret the context of the content and identify the processing, routing and workflow requirements. In addition, the robot enriches the data in conjunction with other available data to execute the automated instructions and render to output required to complete the process. Where the robot is not able to effectively manage the execution and fulfilment, it sends the instruction to the designated user for the intended process and with the assistance of the user then identifies the action to be taken and learns from the application thereof. On first release, the robot functioned as expected. During the testing process however, adjustments were made to improve the success rate and business alignment. During the months following, improvements were made to unlock further value form the initiative. The next stage in the continuous improvement cycle is to add more functionality and improve reach of the robot which will create more opportunities for saving and improved efficiencies in the business. Given the business utilisation profile of the robot, there is no specific requirement for staffing contingencies should the robot be out of commission for any period of time. The Robot forms part of the human process and is intended for acceleration purposes where automation can assist the human beings in executing the workflow requirements. Success of the technical rendering of the solution at Hollard is a direct result of choosing the correct solution and implementation partner with the skill and perseverance to enable the business vision. Combination of the two vendors and their respective competencies, capabilities, track record with implementation and strategic fit with the organisation was the deciding factor, including the access to specialist advisory capability, highly skilled technical resources along with the relationships with universities to promote development quality, support leading edge innovation and provide opportunities for new student talent to develop and participate and gain exposure to current business realities. Evaluation of similar implementations at the time of selection was not possible due to the innovative nature of the solution requirements and the specific configuration envisaged for the business posed unique challenges and logical design guidelines, requiring specific delivery configuration and technology skillsets. Saving in processing time of around 2000 hours per month had been projected. Benefits attained can be directly attributed to the internalisation and business transformation associated with the implementation of robotics. Processes were adapted and streamlined to accommodate the virtual workforce introduction, but these alignments had minimal impact on users. The success is partly due to the effort in correctly positioning the initiative with staff to obtain buy-in and allay fears of retrenchment. Configuring the robots as virtual assistants to the human staff has improved the overall work experience and has alleviated the pressure brought about by high volume work requirements which added little benefit to the clients and end-users.